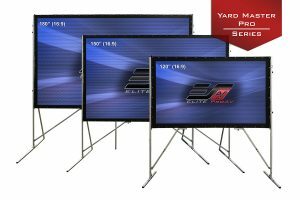 EliteProAV™, the dedicated Commercial AV division of Elite Screens Inc. introduces its Yard Master Pro Series large venue portable indoor/outdoor screen. The Yard Master Pro features a portable folding-frame design that sets up and packs away quickly. The screen incorporates a free standing design to give the presenter a versatile approach to accommodating whatever event is in the plans. Its durable lightweight aluminum framework makes setup easier than ever. The product comes with both a front and a rear projection screen material so there is no after-market shopping required. Rather than deal with the “either-or” now you can be prepared for virtually any projection scenario encountered by mobile presenters and event coordinators. Two projection sceen surfaces (front and rear projection) are included with each Yard Master Pro. They are as follows. CineWhite® UHD (Tension Matte White) is a reference-grade 1.15 gain projector screen material that is certified by the world renowned Imaging Science Foundation for its superb color temperature, contrast and black level performance. It has wide diffusion uniformity that allows equal brightness levels over a 180° viewing angle. The versatile properties of this material make it a natural fit with either standard or short-throw projectors. The material is also suited for either residential or commercial application. WraithVeil is a 2.2 gain rear projection screen material. It has a high gain performance for applications with a high ambient light intrusion. It is ideally suited to prevent shadowing caused by people walking between the projector and screen surface. Its special surface coating enhances color reproduction and black level contrast with wide uniformity for large audiences. The Yard Master Pro features a durable lightweight aluminum square tube construction with superior strength tolerance to withstand the effects of rapid setup and use in a variety of indoor and outdoor events. The single-piece folding frame design allows the material to be mounted quickly. It’s detachable single-piece T-legs with front support braces attach directly to frame and include A-T Leg back braces and Center support bars on larger models. For stability during outdoor use, a full complement of ground stakes and guy lines are included. All of this takes down and stores in a protective soft carrying case. Elite’s Yard Master Pro Series Projection Screen is available now with a starting price at $799 (USD) and is available through the dedicated Professional-AV sales channel. It comes in a 16:9 (HDTV) aspect ratio with 120”, 150” and 180”sizes available. It comes with EliteProAV’s 5-year manufacturer’s warranty and 5% discount for qualified buyers through our ENR-G program for Educational, Non-Profit, Religious and Government/Military organizations. Elite Screens Inc. is a US based company with its world headquarters in California and satellite offices in Germany, Taiwan, China, Southeast Asia, Japan, and Australia. Elite is an ISO9000-2015 certified manufacturer that specializes in producing retail, commercial and home-theater projection screens for the specific needs of these three sales channels. As a leading American screen company, Elite delivers its promise of award winning quality through cost effective products for today’s discerning video enthusiasts. We produce a variety of front, rear and acoustically transparent projection screen materials for virtually any projection environment. Elite Screens, Inc. is located at 12282 Knott St.Garden Grove, CA 92841. For more information, please call 877-511-1211 or visit http://www.elitescreens.com.